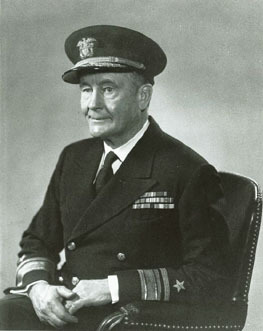 Samuel Eliot Morison, Rear Admiral, Reserve (July 9, 1887 – May 15, 1976) was an American historian, noted for producing works of maritime history that were both authoritative and highly readable. A sailor as well as a scholar, Morison garnered numerous honors, including two Pulitzer Prizes, two Bancroft Prizes, and the Presidential Medal of Freedom. Samuel Eliot Morison was born in Boston, Massachusetts to John Holmes Morison (1856–1911) and Emily Marshall (Eliot) Morison (1857–1925) and named for his grandfather Samuel Eliot. He married twice and was the father of four children by his first wife, Elizabeth S. Greene. (One of these children, Emily Morison Beck became the editor of Bartlett's Familiar Quotations.) After his wife Elizabeth's death in 1945, he married again to a Mrs. Pricilla B. Shakelford. Morrison died on May 15, 1976 of a stroke at the age of 88, and his ashes are buried at Northeast Harbor, Maine. Morison held that the experience and research should be combined for writing vivid history. For his Pulizer-winning Admiral of the Ocean Sea, Morison combined his personal interest in sailing with his scholarship by chartering a boat and sailing to the various places that Columbus was then thought to have visited. Statue of Morison on the Commonwealth Avenue mall. Unlilke World War I, for which the US military had not prepared a full-scale official history of any branch of service, it was decided that World War II would be meticulously documented. Professional historians were attached to all the branches of the US military; they were embedded with combat units to witness the events about which they would later write. Toward this end, in 1942, he was commissioned into the Naval Reserve with the rank of Lieutenant Commander. The result was the unmatched History of United States Naval Operations in World War II, a work in 15 volumes that covered every aspect of America's war at sea, from strategic planning and battle tactics to the technology of war and the exploits of individuals in conflict. A one-volume abridgement of the official history, The Two Ocean War, was published in 1963. In recognition of his achievements, the Navy promoted Morison to the rank of Rear Admiral (Reserve). In addition, the frigate, USS Samuel Eliot Morison (FFG-13), was named in his honor. A bronze statue of Morison is on the Commonwealth Avenue mall in Boston. The celebrated British military historian Sir John Keegan has hailed Morison's official history as the best to come out of the Second World War. One of his research assistants on that project, Henry Salomon, went on to conceive the epic NBC documentary series Victory at Sea. Most of these have been reprinted and reissued numerous times. The Growth of the American Republic (with Henry Steele Commager, New York: Oxford University Press, 1930 [as Oxford History of the United States; 7th ed., 1980]. Revised and abridged edition with Samuel Eliot Morison and William E. Leuchtenberg. Published by Oxford University Press in 1980 as A Concise History of the American Republic, rev. 1983. Legion of Merit with Combat Distinguishing Device "V"